My husband is obsessed with watches and I just want them to be pretty. It’s hard to find a nice and stylish watch that doesn’t break the bank. 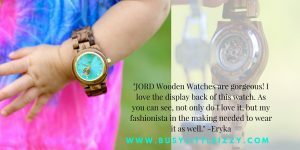 I must say, I found a company that makes gorgeous men’s and women’s watches that are affordable and they even have automatics. 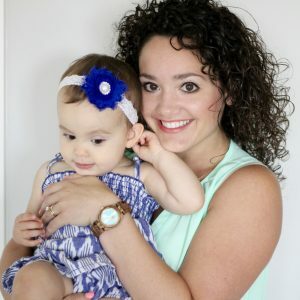 Here is what I know from all of the talks with my husband about watches. Automatics never need need a battery, they are powered by the movement of your wrist and they look fun if you have the skeleton back like mine. 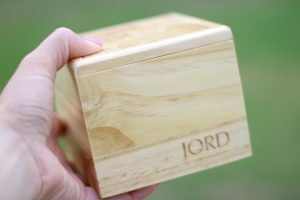 Each JORD watch comes in a cool wooden box. Inside you will find your watch snuggled on a soft pillow. I love so many things about the watch. I love how it clasps, the wood style, the dial color, the gold details on the bezel, hands and markers, and the fact it is a skeleton watch (check out the back). 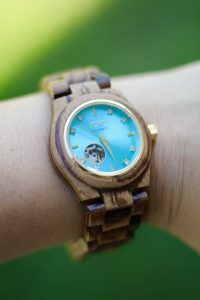 You can find my Cora Zebrawood and Turquoise watch here. If you know Izzy, the you know she already has a love for jewelry and had to wear my watch around for a bit as well. 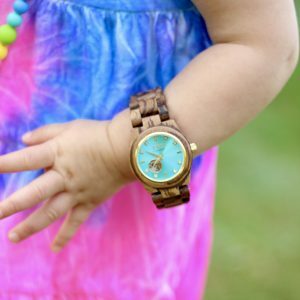 She’s a fashionista in the making in mommy’s wood watch. Maybe she will be a yellow gold lover like me. This watch snaps on easily and is extremely comfortable during our day to day activities and play. 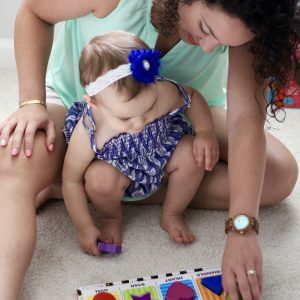 Nothing better to a mommy than when fashion and comfort come together. Go find YOURSELF a beautiful watch here. There is no loser, everyone who enters will get a $20 e-gift card to spend toward their watch! This is a great watch! I love the color of the face! This is such a beautiful watch! I hope I win the gift card!! 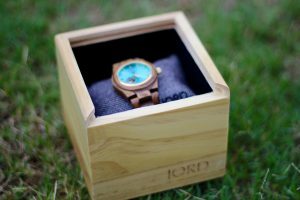 If I got a JORD watch, that would definitely be the one I picked, love the center color! Thank you, I’m obsessed too! Be sure to enter the giveaway! Love the color of the watch face, and love the shot of Izzy wearing it, too! Totally didn’t realize that they don’t need batteries….that is a game changer! This is a beautiful watch! I just entered the Giveaway! 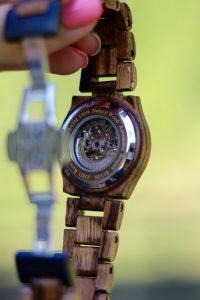 Well now I just love these wooden watches! Gotta get one for myself! I just can’t get over how beautiful this watch is!! The color ????? it’s like the ocean ? Thank you, that’s what I loved too! The color is amazing! I am so obsessed with these watches! I need one!